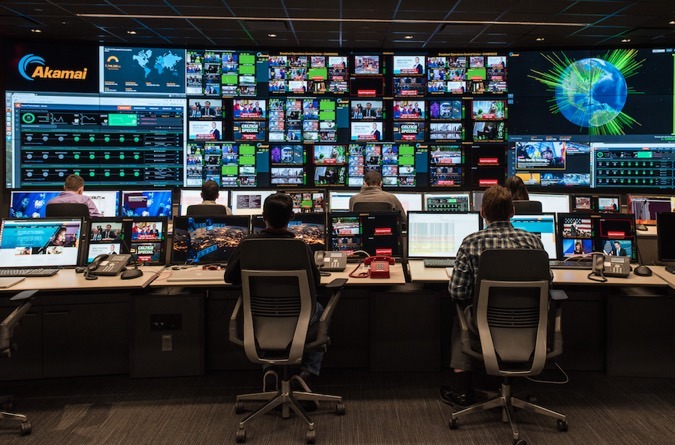 Akamai has opened a Broadcast Operations Control Center (BOCC) in its Cambridge, MA office, making a multi-million dollar investment in delivering over the top video at a quality level better than broadcast and cable TV. I received a tour of the BOCC last week from Matt Azzarto, Akamai’s director of media operations, who oversaw the BOCC’s construction over the past 6 months and will run it going forward. Matt came to Akamai from NBCU where he was a long-time broadcast systems engineer. Matt said the BOCC’s goal is to preemptively detect issues and resolve them before the customer or the viewer notices them. Akamai monitors the live streams in real-time from the encoder through to the player and has a series of distributed beacons that provide alerts to BOCC technicians 24x7. The BOCC team ranges from 12-50 during large events. Akamai has built a suite of dedicated tools on its Media Analytics, called the Broadcast Operations Support System (BOSS), which is being beta tested currently with several customers. Version 1.0 of BOSS is slated to go live in September. In our tour, Matt walked me through multiple screens, which depicted analytics around delivery quality. We looked at real-time data feeds and were able to drill down for more granular inspection of stream quality at the component level. These insights enable Akamai to provide stronger service level agreements. The BOCC’s initial performance metrics are meantime to alert, meantime to respond and meantime resolution. The BOCC works in conjunction with Akamai’s Network Operations Command Centers and Security Operations Centers that Akamai believes differentiates the company from competitors. The BOCC crystalizes just how mission critical live video online has now become. It wasn’t that long ago when online video was a best-efforts type of experience - sometimes the stream worked and sometimes it didn’t - and viewers didn’t expect much more. Now, however, with live online events going mainstream, more than half of US homes having connected TVs that bring video to the living room and significant advertising and SVOD revenue at risk, top-tier delivery is no longer an option. Akamai will be demo’ing the BOCC at the NABShow this week in Las Vegas.